Nettles with walnuts. Recipes from Russia. Nettles with walnuts and thyme. 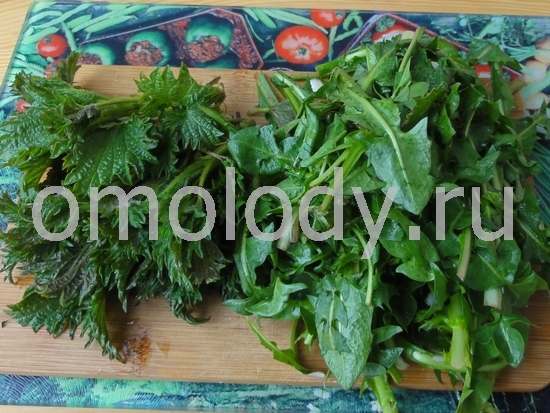 1 kg (2,2 lb) washed nettles, or spinach. 3 - 7 garlic cloves. 1 - 2 tbsp thyme, chopped. 4 tbsp walnuts, chopped, toasted. salt, red pepper, 6% apple vinegar to taste. 1. 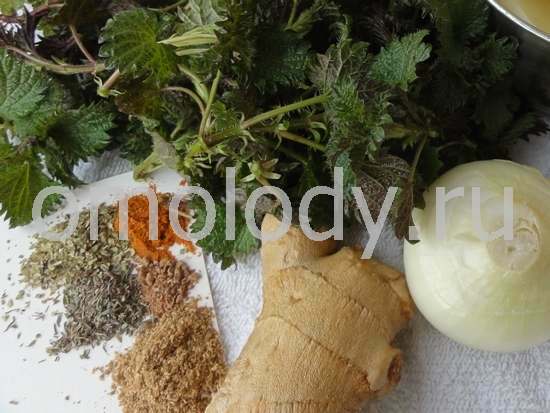 Wash nettles, put into boiled water and cook for 3 - 4 minutes. Strain and drain well. Chop cooked nettles finely. If you use Spinach, wash, drain and chop it. 2. Fry flour in the skillet with oil, add red pepper. Add chopped nettles, thyme, garlic, vinegar and several tbsp of water. Simmer for 10 minutes. 3. Season, add walnuts and stir. Decorate with half eggs, serve hot. Nettles pesto with walnuts and basil. Description: You can then blanche nettles in boiling water for 30 seconds to remove the stingers. Take all of the ingredients and put them in a food processor. Blend until you produce a smooth paste. Spread over your favorite salad, pasta or pizza. You can add the amount of basil and pepper to taste. It’s so tasty used as a dip or on a salad. Soak walnuts in water for atleast 3 hours. After soaking, drain, discard soak water and place walnuts in a jug for blending. Peel and finely chop 1 heaped teaspoon worth of fresh ginger. Roughly chop your apple and juice lemon. Add all ingredients together and blend in the jug until you achieve desired consistency. Serve immediately. It should also keep in the fridge for a 2 days.